Safety, throughput and energy efficiency are central requirements for automated stacker cranes. With the easily integrated SEOS technology these aspects can be further improved. The new developed software is able to calculate the movement of the mast precisely. With this information the drive engine can be controlled in such a way that oscillations of the mast are avoided. This optimal driving trajectory and an intelligent anti-vibration controller achieve considerable improvements compared to conventional systems. Moreover, the SEOS software is compatible with all leading hardware manufactures and can be integrated into existing plants with minimum effort. Conventional drive control systems cause oscillations of the mast and customary feed-back controllers cannot damp these vibrations fast enough. Previous approaches, such as anti-pendulum drives or creep speeds, are either expensive or slow. SEOS is the first technology that meets all requirements of automated storage and retrieval systems. 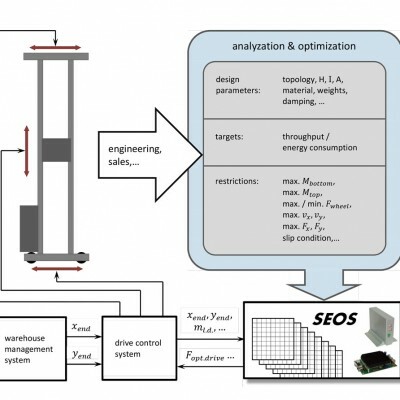 The foundation of SEOS is a precise model of a stacker crane, which enables a calculation of its motion. Detailed restrictions, such as the permissible operating range, can be set individually. In this way, a precise forecast of the mast movement can be computed, which avoids oscillations and meets all requirements and restrictions. Therefore, primarily safety, throughput and energy efficiency are increased, but also the wear and tear is reduced due to lower mechanical loads. The SEOS-software can be easily integrated into new plants, but also existing stacker cranes can be extended and enhanced. Before installation the targets and requirements are defined together with the customers. In a first meeting the already implemented hardware and available interfaces are clarified. Installed engines and inverters can be further used without any changes. A major benefit of the software is its compatibility with all leading hardware manufactures. All safety devices, which are already in use, are not affected by the integration. If a PLC controller is available, then no additional hardware is required for SEOS. Once these matters have been resolved, SEOS can already be integrated. All required measures are performed by Berger Engineering on site. If a new PLC controller is necessary, it is connected to the inverter and the bus system is started. 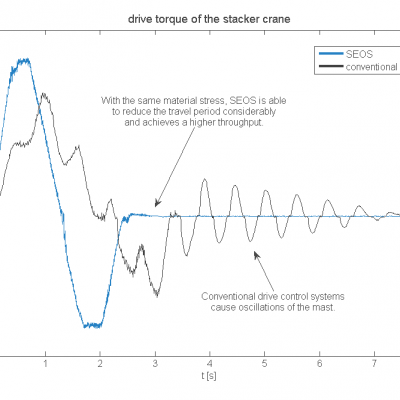 SEOS automatically adapts to the connected stacker crane, calculates optimal driving trajectories and is ready for use. The optimal driving trajectory and anti-vibration controller of SEOS eliminate mast oscillations and therefore waiting periods at target positioning. Since mechanical stress is also considerably reduced, the acceleration of existing plants could be increased by 115%. These measures shortened the cycling times and increased the throughput by 40%. Mast oscillations increase the risk of mechanical overload, which can cause cracks. Through the combination of the patented feed-forward and anti-vibration controller, vibrations of the stacker crane can be avoided with SEOS. Even at dynamic speeds with high acceleration the movement is smooth and well-controlled. This reduces mechanical stress and protects the plant. The mechanical factor of safety of conventional systems could be increased by 1.5 times. Since oscillations are avoided and the operation of the stacker crane is smooth and well-controlled, peak loads and therefore peak energy consumption is reduced. Moreover, cycle times are shortened, which further lowers energy consumption. On existing plants the energy consumption could be reduced by 1/4 with these measures. In addition, through a reduction of mechanical stress SEOS enables lightweight constructions, which also has a positive impact on energy efficiency. Since SEOS forecasts the mechanical stress for every movement, it is assured that mechanical limit values can be met. Through an intelligent acceleration and deceleration of the stacker crane, mast oscillations are avoided. This lowered mechanical stress by 35% at existing plants. Hence, mechanical components are protected and the wear and tear is reduced. The mast oscillations depend on a variety of parameters, such as the travel distance, smoothing time or height of the lifting device. In order to keep these vibrations to a minimum, with conventional systems the commissioning engineer usually has to adjust the control parameters by extensive trial and error. In contrast, SEOS can automatically estimate optimal parameter settings via its integrated modelling and optimization, which avoid oscillations. This saves both time and money. Higher stacker cranes are much more susceptible to vibrations. SEOS eliminates oscillations, so that construction heights can be increased by 30%. This is possible without any design modifications of the mast. Therefore, a better market coverage is achieved and additional customer requirements can be met with existing designs. Hence, development costs can be reduced. Moreover, the vibration-free drive control system enables lightweight designs even with very high stacker cranes, which is especially interesting for high-bay storages.